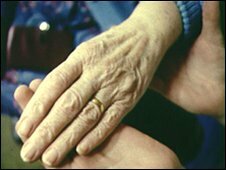 The UK's ageing population is set to cause a huge rise in the number of older people living with long-term illnesses, campaigners have said. Help the Aged says that by 2025 there will be a big increase in the number of over-65s with heart disease, osteoporosis and dementia. It warned this could stretch the NHS to breaking point and called for more research into these conditions. But the Department of Health said measures were being taken to cope. Having analysed current disease patterns and predictions about the ageing population, Help the Aged made a number of estimates about the future levels of ill health in the elderly population. The charity said there was likely to be a 46% rise in the number of people living with the effects of stroke, from 601,000 now to 878,000 by the mid 2020s. And the researchers said those living with late-onset dementia would go up 50% to one million while the number of elderly people with heart disease would rise by 42% to 2.6 million. Levels of incontinence and osteoporosis were also likely to rise by a third, while sight problems could go up by over half, the charity has claimed. In total, more than six million elderly people could be living with a life-limiting condition by 2025 - a 45% rise, Help the Aged concluded. These rises mostly mirror the expected increase in the over-65 population which stands at just under 10 million in the UK currently, but will reach about 14 million in 16 years' time. And the researchers warned such a scenario could see the cost of caring for older people rise from £40bn a year to over £50bn. Dr Lorna Layward, from Help the Aged, said: "Unless we find ways to prevent or treat these conditions, the strain on society and its infrastructure will reach breaking point. "More attention and funding must be directed to researching the causes, prevention and treatment of the diseases and disabilities that become increasingly common with age." But the government said it was taking the consequences of the ageing population seriously. The Department of Health said it would soon be publishing plans for an overhaul of social care, while more money than ever was being put into research for these conditions. A spokesman said the vascular screening programme which was being phased in from this year would save lives by preventing heart attacks and strokes. He added: "The government is already preparing for the pressures of an ageing population." Professor Alan Maryon-Davis, president of the UK Faculty of Public Health, said: "An even more pressing problem among the growing number of over-65s is the widening health gap between the haves and have-nots. "Poorer people suffer more chronic disease - and this disparity is getting worse. "We must focus our efforts where the need is greatest."